The 1920s ushered in the era of prohibition, flappers, the Great Depression, and the Golden Age of Radio. As the depression worsened in the early 1930s, those that were fortunate enough to do so would gather around the family or neighbor’s radio and take some time to enjoy such programs as Professor Quiz, the Champion Spark Plug Hour, and The A&P Gypsies. However, the programming that elicits the strongest remarks and memories from the individuals of this era are President Roosevelt’s Fireside Chats. Starting in March of 1933 Roosevelt would give 30 of these addresses to the American people with his final Fireside Chat occurring in June of 1944 a little less than a year before his death. Roosevelt’s easy style bred a type of familiarity and reassurance that was tremendously successful. The Fireside Chats would far surpass the number of listeners from even the most popular programming. After class, I found myself at The Liquor Pump talking to Harry and he had just received a shipment that included 21st Amendment’s Fireside Chat Ale. This was exactly what I had in mind and the Beer of the Week was decided. Like one of Roosevelt’s addresses, 21st Amendment has me huddled around this beer and I am enjoying its message. From the playful artwork on the can –Roosevelt is enjoying (I presume) a beer from a snifter by the fire and if one looks carefully, he is chatting with an elf in the chair opposite him – to the quick dark teak colored pour this ale entices the senses right from the start. The warm white head lasts quite a while which gives ample time to take in the demonstrative malt notes which are completely laced with the scent of an overly ripe banana that is neither cloy nor has the sharp notes of banana like a Belgian. As the head dissipates leaving a significant amount of lacing, the notes of spice – primarily nutmeg and clove – become evident. The slightly sweet malts are made complex by the dry taste of raw cinnamon and clove. The finish is long-lasting; the malts disappear, but as the malt fades I am left with a touch of fruity chocolate, cinnamon, and nutmeg. One particular aspect that is of particular note is how wonderfully bitter this ale tastes. No one would ever confuse it with an IPA, but most winter ales are aggressively malty, which tends towards quite a bit of sweetness. 21st Amendment uses a generous amount of Magnum and Goldings hops that round out not only the taste (self-styled as 45 IBUs) but cuts a good amount of sweetness from the nose as well. This is by far the best winter seasonal in recent memory. I appreciate bold flavors, but many of the winter seasonals have so much spice that it becomes a jumbled mask of flavor that can hardly be defined as beer. Others are so unimaginative that they don’t even warrant a second thought. 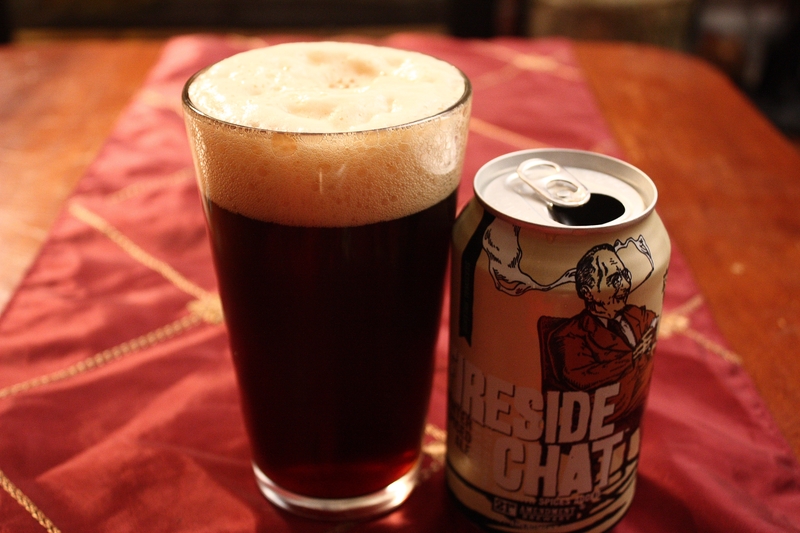 Fireside Chat is now the measuring stick by which all other winter seasonals will be measured. It is eminently drinkable. It is absolutely packed with flavor. Yet, as a relatively powerful brew at 7.9%, it cleverly disguises itself as a flavorful session beer. That is quite the powerful deception. It’s time to crank up the old Victrola and throw another log on the fire because I envision quite a few more of these finding their way to me. ~ by its12oclocksomewhere on October 25, 2010.